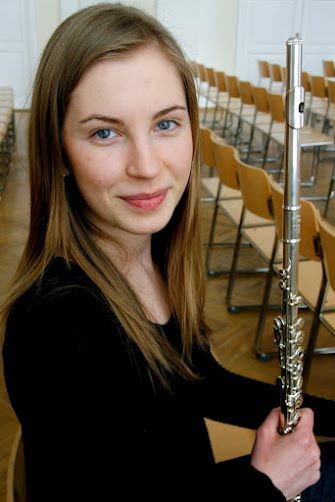 Maria Luisk, born in Tallinn, Estonia, started to study the flute at the age of 8. She has studied with Gaby Pas-Van Riet (Musikhochschule Saarbrücken, Germany) and Pirmin Grehl (Hochschule Luzern-Musik, Switzerland). She has played in many chamber music groups and youth orchestras e.g. Estonian Festival Orchestra, Baltic Sea Philharmonic, Junge Deutsche Philharmonie, Junge Philharmonie Zentralschweiz, Landesjugendorchester Rheinland­Pfalz. Maria has participated successfully at different competitions, some to mention: in 2013, she was awarded 1. Prize at Richard Bellon Competition for Young Classical Musicians, 2. Prize in “Casino­Gesellschaft Competition”. Maria has received important grants for her achievements from Rotary Club, Deutschland Stipendium, Konservatioriumsverein Dreilinden. Additionally, in 2013 she was selected as a scholarship holder to visit Richard Wagner Festspiel in Bayreuth. She has participated in masterclasses with Andrea Lieberknecht, Renate Greiss­Armin, Carin Levine, Felix Renggli, Jasmine Choi, Peter­-Lukas Graf. During the season 2016/17, she played in Bern Symphony Orchestra and continued her studies in Lucerne. In Fall'17, she will start pursuing her Master’s Degree at Yale School of Music with Ransom Wilson.